Illuminati is where the English word 'luminaries' comes from. 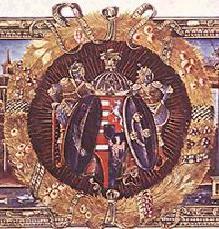 Illuminati, the illustrious luminaries of their time, were the artists who decorated texts in Medieval and Renaissance Italy. During their day, these painters were just as famous as the artists who painted on gesso on wood, and on soft plaster on walls. But today, only artists such as Michelangelo and DaVinci are household names. Ironically, today the work of the illuminati can be seen by more people than ever before. 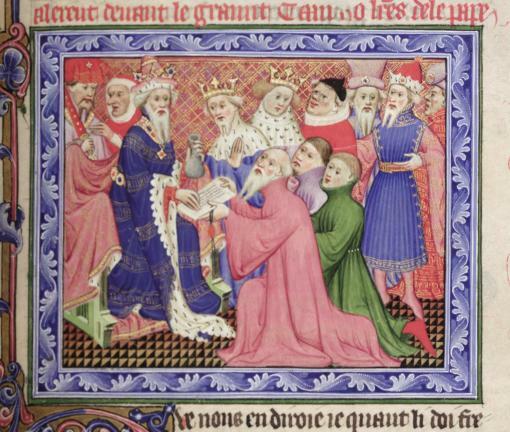 The texts they illuminated, are no longer in the hands of popes, princes, and wealthy merchants. Today, their work is displayed in museums, with usually one paged turned each day to reward the frequent visitor with a look at all the splendid artistry. Luckily for us, many museums have photographed the pages and put them on-line, so the Internet visitor can view many pages at one go! I provide images on this page when copyright restrictions allow, and link to the museum sites where you can view lots more images. A full list of links is at the bottom of this page. Browse at your leisure. 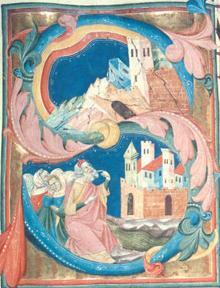 This image is an illuminated page from 1487 from the WebGallery of Art. 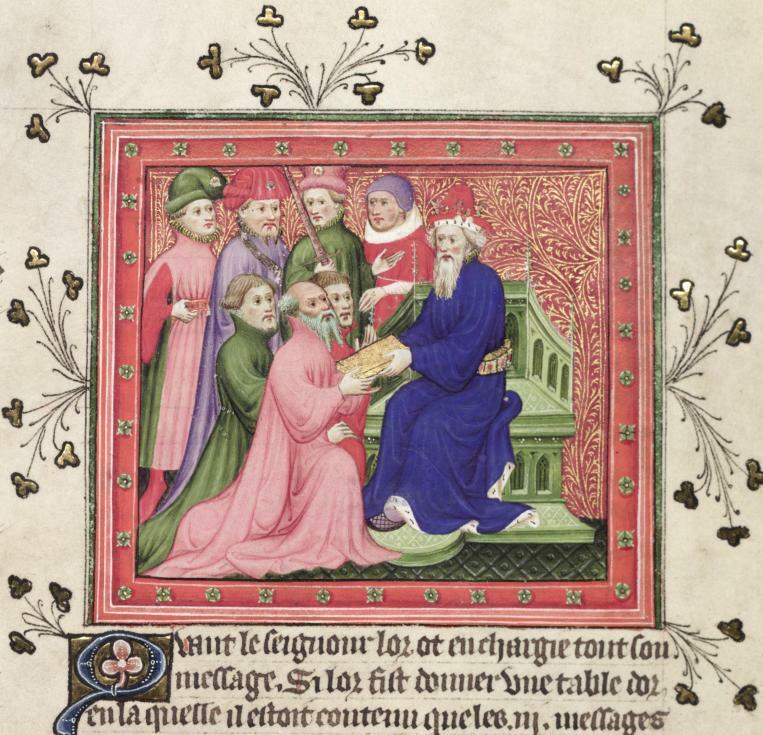 This is the best link where you can view illustrated manuscript pages from 1150 to 1550 from many countries. I'll eliminate my use of words like 'stunning', 'amazing', 'gorgeous', 'mini-masterpiece' and so forth on this page, but just assume I mean that for every example I offer up to you, because it's what I think! Appreciate that the they must have used magnifying glasses to help paint them and to enjoy them, because some are truly miniscule. These artists worked from roughly the year 1200 to the 1500s. This corresponds, not coincidentally, with the advent of primitive book-making techniques through to advanced book-printing techniques. The earliest technique was the hand-lettered book. 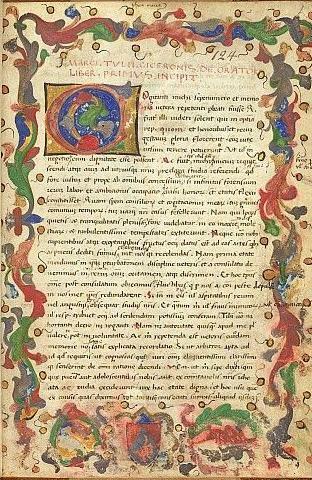 This example is from 1400s Northern Italy of Cicero's writings now at the British Museum. 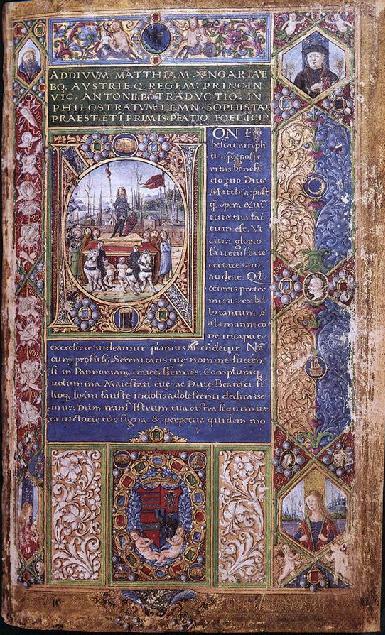 This example of a tooled leather book cover is of a 1470 Venetian Bible now at the Bodleian Library. Scriptoria made way for wood carvers who carved text and crude images in reverse into a flat piece of wood: woodcuts. The wood was then rolled with ink and stamped onto a page. 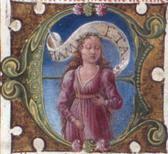 The pages were then assembled as described above, and the hand painting was done as before. When fixed and moveable type was invented, the text was assembled into a frame, rolled with ink, and pressed onto the paper. 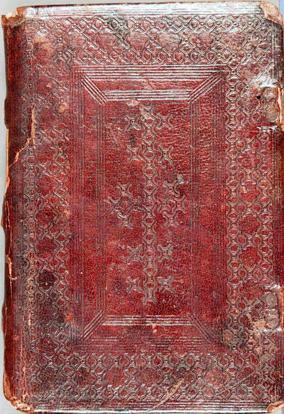 The binding and decoration was then done by hand. But even at this point in time, woodcut images were still stamped onto pages after the text printing. Even today, you can hire a calligrapher do this kind of work. They are the inheritors of this ancient art form. 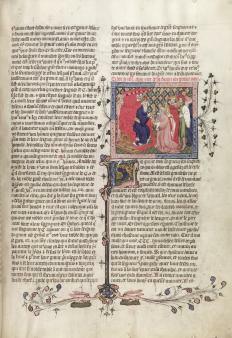 The Middle Ages is considered by connoisseurs as the high-point of illuminative arts perhaps because it is a time when both the text and artwork were done by hand, and these texts are the major source of Middle Age paintings. 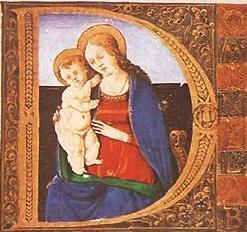 During the Renaissance, Italian illuminati broke away from the dominant Flemish school and developed their own style. 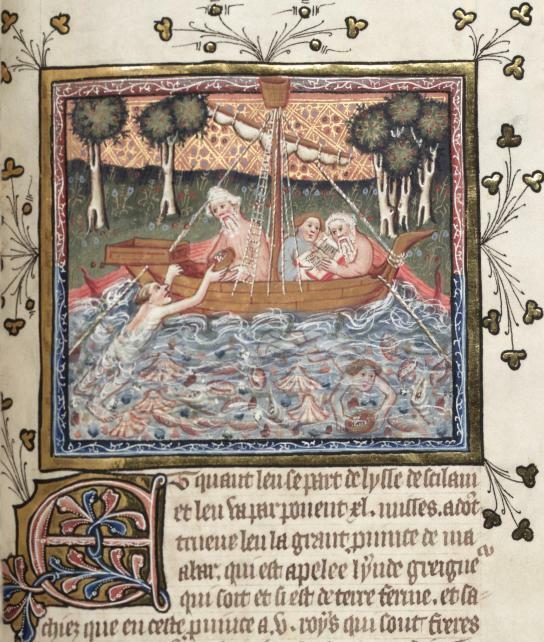 Bibles for the alters in churches were very commonly illuminated, and other church prayer books (1470 Venice Bible, and 1450 Padua Bible now at the Bodleian Library)). One book that was a best-seller was one for a very special reason: it was an early reader. Aesop's Fables was used throughout Italy as a book to teach people how to read . The Greek fables were almost always illustrated with woodcuts to help the new-reader figure out the texts. 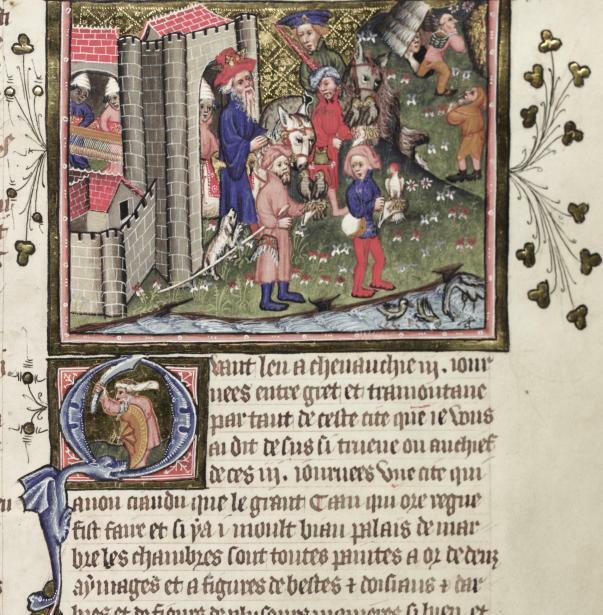 Here are some of the miniatures from a rare manuscript of Marco Polo's Travels from 1400, now at the Bodleian Library and available to view on-line (from page/folio 218-271). The artwork is by a Johannes and his school of artists. 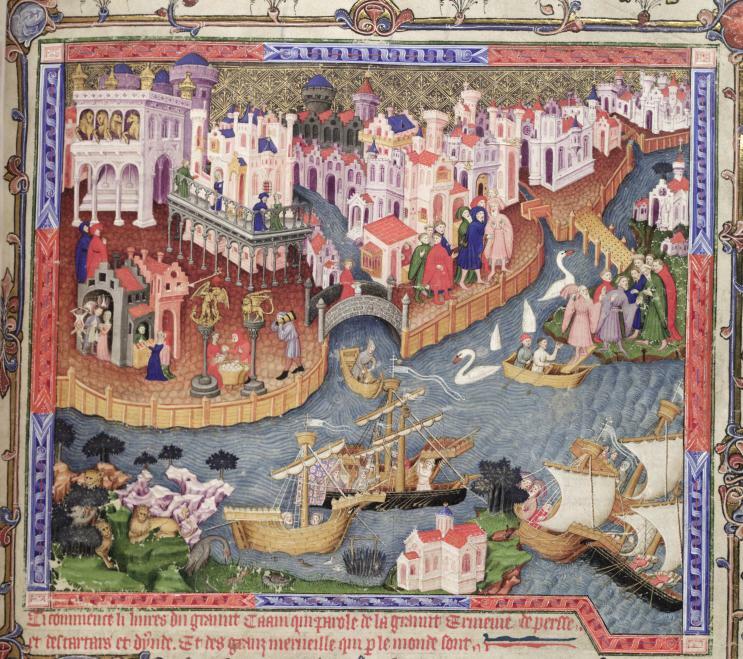 This painting supposedly shows the Polos leaving Venice to return to the east, with Marco in tow. Look to the right, next to the giant swans, and you can see Marco (in red) with his father and uncle, about to board a very small boat. Venice, as painted by Flemish artists who knew only certain things about the city, tends to look a lot like Brugges. The add the famous 4 horses in what is supposed to be St. Mark's Cathedral (left-top), and the arches on the ground floor of the Doges Palace, with what looks like the Doge and his wife on the balcony, watching the Polos leave. Here the Polos receive a golden passport from the Khan. 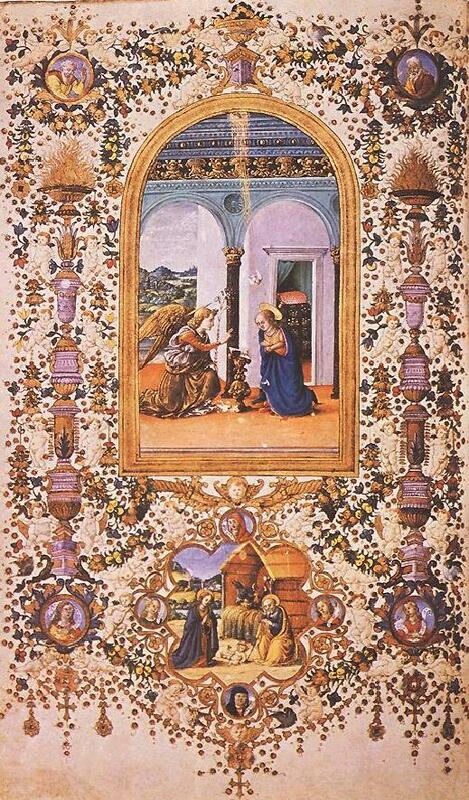 It's amazing to see the background and floor paintings in this miniature artwork, as well as the frame decorated with stars. And the flowers around the image are filled with metallic ink. After the next image, I include an image of an entire page, so you can see just how small these miniature paintings really are. Mind-boggling. Here Marco and his uncles are giving the Khan the oil from Jerusalem and the messages from the Pope. Again, the background, floor and frame are stunning in detail, as are the robes of the Khan and courtiers. 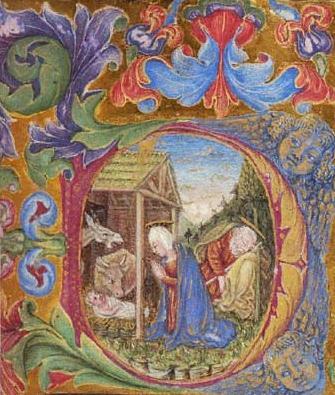 Much of the detail was certainly painted with single-haired brushes. 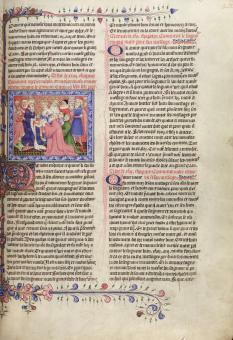 I include an image of the whole page, so you can see just how small the images really are. It is curious to see that they had no idea what a Khan (or Caan as they call him in the French, it was written Kaan in the English translations) would look like. They guessed a scrawny guy with a wispy beard. They got the beard part so-so, but the Khan was certainly not scrawny, judging from the images we have of him, but stocky with a round head. 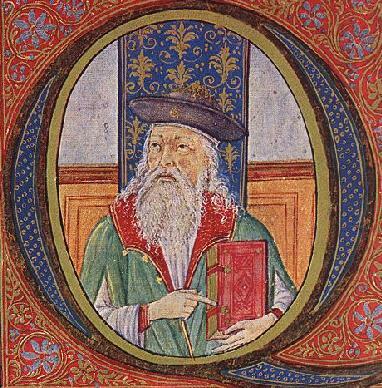 The red texts are Marco Polo's chapter headings. The black texts are the chapter contents. 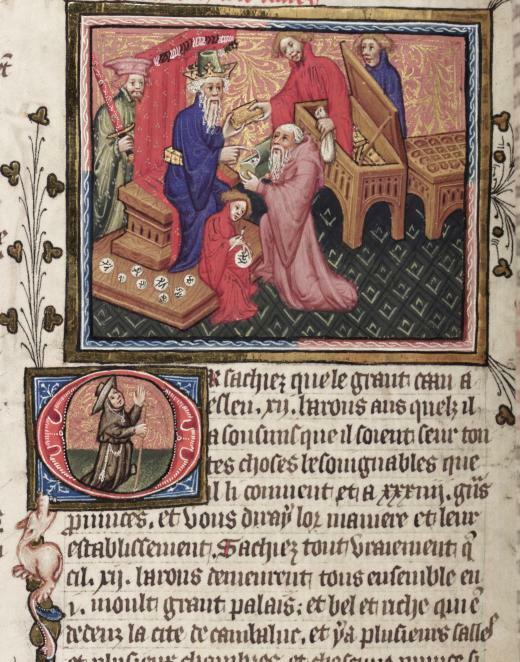 This manuscript is in French. 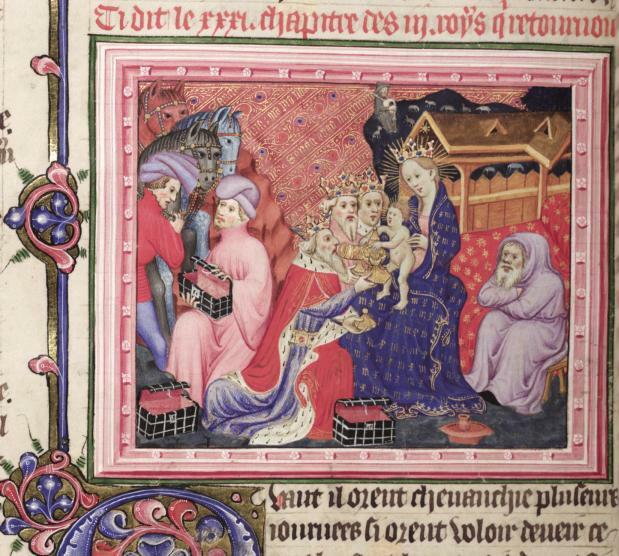 This Adoration of the Magi depicts the scene described by Marco Polo, as told to him by people in Persia, about the Three Kings visiting Mary, Jesus and Joseph. Joseph is my favorite here, shunted off in the far right, on a hard stool, left out of the whole gift-giving thing. 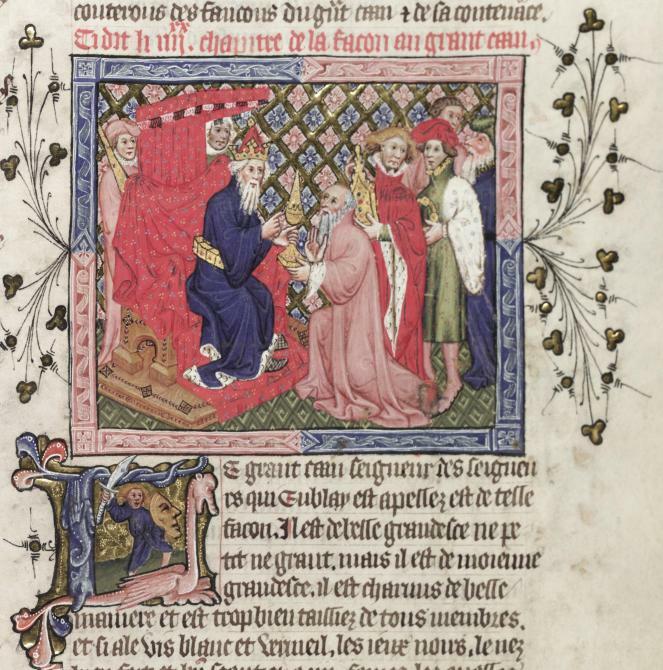 Mary has a crown and regal robes. All Joseph has is a plain robe. I don't know who, but the three open boxes fascinate me. I want one of those boxes. The backgrounds are jewel-like. The Khan goes hunting with his falcons, dogs and staff. His palace has a decided medieval look to it. 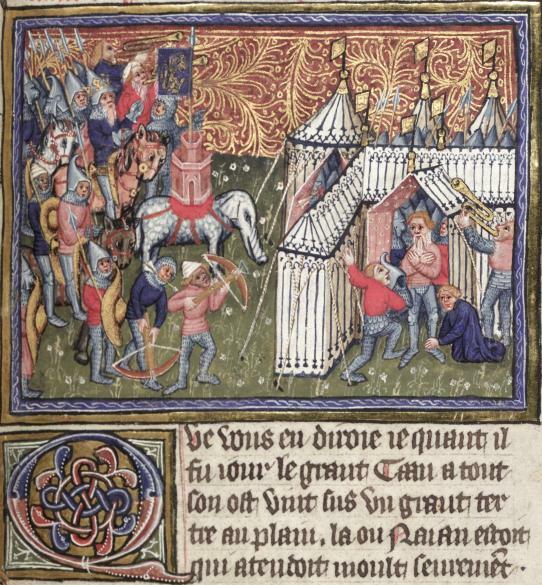 I've included in this image the following capital letter, illuminated with a Mongol soldier inside the 'Q', armed with shield and sword, and a dragon spewing out the letter. This is my favorite miniature, not just because the Khan is getting dressed in European armor (not Mongol war armor, and not just because he has Renaissance tents rather than Mongol tents as he prepares for battle. This is my favorite painting because of the Flemish artists' depiction of a Mongol war elephant. They clearing have no idea of the size of elephants, and only know that the animal has big ears and a long snout. So here we have a cow with big ears and a long snout, smaller than the horses. Here the Khan receives tributes from representatives from all his conquered lands. The detail is, again, a thing of wonder. I've included the following capital letter so you can see another Mongol warrior with weapon and shield, and the creature that makes up part of the letter. 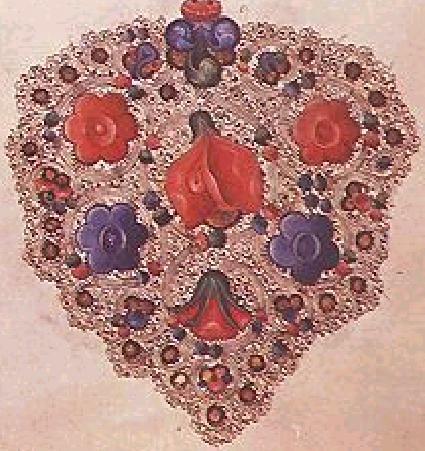 Some of the dots are applied with the head of a needle. This is the banquet scene as described by Marco Polo. 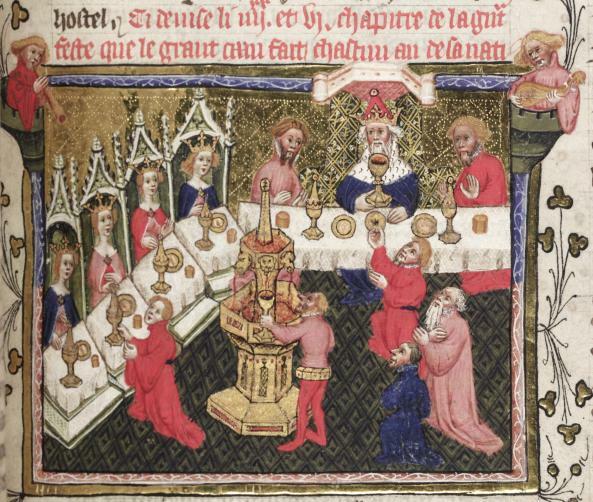 The Khan is at the head table alone, only surrounded by Barons who served him his food and drink. The Khan's wives are seated at a lower table to his right. All the service is of gold. Marco also describes a drink dispenser that other later visitors to Mongols-Tartars describe too, the fountain filled with drink. The artist put the musicians that Marco described at these events, in the border. The musicians played every time the Khan drank, so that everyone else would stop and pay tribute to the Khan throughout the meal (the kneeling men). Here the Great Khan is going hunting with his dogs. 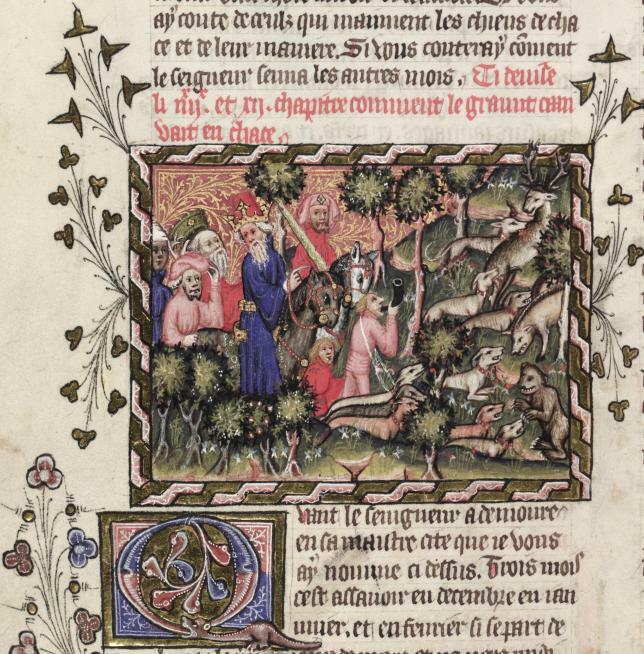 At the right are the wild animals, a deer, boar and a funny-looking bear. I personally prefer Dino the dinosaur on the capital letter that follows. Here the Khan's barons are helping him keep his accounts. 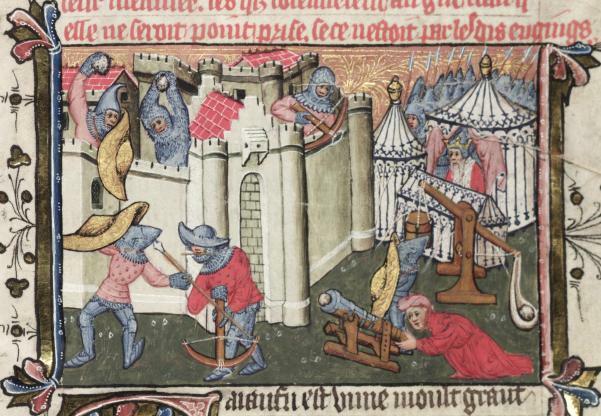 Here the Mongols are fighting with an enemy, using catapults and cannons. This lovely image depicts Marco and his father and uncle in India, where pearl-divers collect the jewels from the oysters below the water. One hands the jewels to the uncle, while another is still below the water collecting jewels.